Bacterial necrosis is caused by the Erwinia bacteria and attacks the saguaro cactus, as well as other indigenous cacti in the Southwest desert, including cholla, prickly pear, barrel cactus, and organ pipe cactus. The first symptom of this bacterium is the brown or black goop that oozes from the cactus’s flesh, accompanied by a strong decaying smell. The infected area swells and eventually splits open to reveal dark liquid. Other infected areas may become dry and crack open to expose diseased tissues. Symptoms appear after periods of heavy rain. The bacteria live in diseased plant tissues and spread by insects, moths, and small animals, as well as in infected soils. 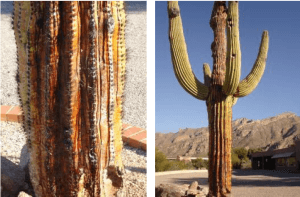 Heat stress or frost damage weakens the saguaro, making it more susceptible to the disease, which then attacks through wounds or natural openings. Removal of the diseased tissue is the only way to control the spread of infection. If the lesion is large or not easily accessible, consider complete removal of the affected area—a large, weakened arm could fall and cause injury or damage. If the infected area is small, remove the tissue and up to a half-inch of the surrounding healthy tissue. Try not to puncture or tear any additional healthy tissue where the bacteria might survive. Let any moisture drain out of the infected area, and then wash the area with a solution of one part household bleach to nine parts water. Allow the wound to air dry and heal. Dispose of the decayed material promptly. When necrosis is noticed early, there is a good chance that the saguaro can be saved and live for many years.